The grant was used to correct an anogenital abnormality. The surgery took more than two hours and was a success. Without the grant from the Petfinder Foundation, we may not have been able to afford the surgery. Jack would have had a life of chronic urinary-tract infections and issues with defecating. Now this super-affectionate baby will be able to find a loving forever home. Jack came to us as a 6-week-old kitten. His foster noticed he was having issues defecating. Upon examination, our vet noticed an abnormality. A surgeon was called in, and she said she could repair him. She was prepared to do the surgery when Jack was small, but realized that it would be best if he were a little older. The surgery was delayed until November. 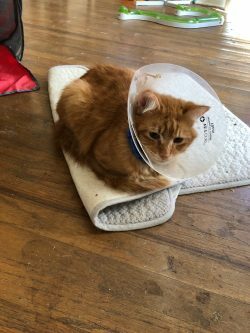 Jack had his surgery on Nov. 28, 2018. It was not until the surgery was started that the doctor realized that his problem was even more severe. 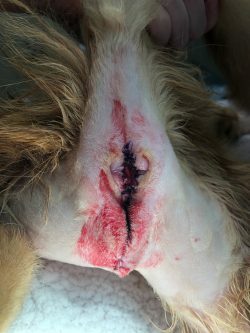 The surgery took more than two hours, and both our regular vet and the surgeon said they had never seen anything like it. We visited Jack at the clinic the next day, and he was back to his regular super-affectionate, purry self. Jack has at least three weeks in a e-collar. He is back with his foster mom. He is being loved and spoiled. Once Jack has completely healed from his surgery, he will be looking for his forever home. Jack sends his thanks to the Petfinder Foundation for making him well, and soon he will be counting on Petfinder.com to help find a home.